Friends of Glencoe Swale are not the only ones committed to learning about how to positively impact the eco-system of the sub-watershed of the McKay Creek in the Tualatin River watershed. April Olbrich, Tualatin River Watershed Council Coordinator, arranged a tour of a riparian zone restoration project on the swale that is currently underway at Glencoe High School. She connected us with Steve Kennett, SOLVE Team Up Program Coordinator, and Nicole Poletto, SOLVE Green Team Program Coordinator. Glencoe High School is our direct neighbor. Although our wetland property borders Glencoe’s, we had no idea what “the neighbors have been up” to until the meeting with Steve and Nicole. My husband and I were guided along trails where hundred’s of students have assisted with invasive plant removal and the replanting with native vegetation. We learned how burlap sacks, donated by area coffee distributors, are used to block invasive Reed Canarygrass from growing around new plantings. And… we had our first Weed Watcher encounter with a high-priority invasive plant: Giant Knotweed. And here, with Nicole, in the patch, for size appreciation. Look how the Giant Knotweed towers well above her. I couldn’t get over the height of this plant as well as the size of the leaves. Although, SOLVE does not like to use chemicals in restoration work, they will return in the Fall to treat this weed with herbicide… the only way to eradicate this monster plant. During the tour, the idea for the formation of Friends of Glencoe Swale was mentioned to Steve and Nicole. They were both excited and supportive. Steve would like to attend a future meeting. I’m delighted to have the Tualatin River Watershed Council and Tualatin Soil and Water Conservation District enthusiastically supporting the formation and organization of Friends of Glencoe Swale. 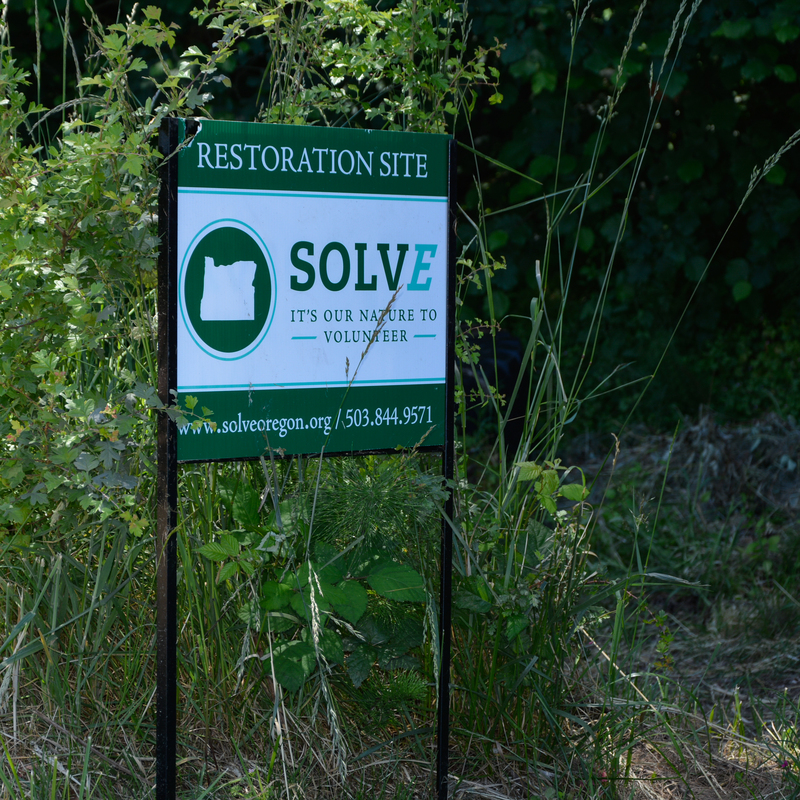 The interest expressed by Steve is very appreciated- SOLVE is a well-repected environmental champion in the state of Oregon.